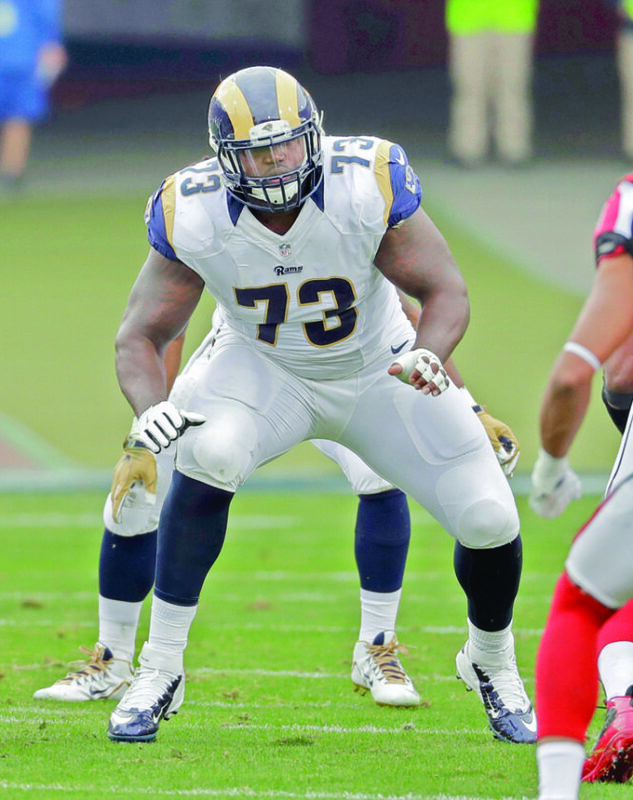 ALLEN PARK — Greg Robinson is thankful to have a fresh start that the Detroit Lions were desperate to give him. “It’s really refreshing,” Robinson said. Detroit attempted to bolster its offensive line, to make up for the potential loss of tackle Taylor Decker, by acquiring Robinson from the Los Angeles Rams. The trade for Robinson, for an undisclosed draft pick, and adding free agent Cyrus Kouandjio seem to be signs the Lions are bracing for at least starting the season without Decker protecting Matthew Stafford’s blind side. Decker is out indefinitely after an offseason injury led to shoulder surgery. Lions offensive line coach Ron Prince stood between Robinson and Kouandjio, talking and gesturing to teach them about the team’s scheme. Decker, with his right arm in a sling and protected by a brace, also appeared to be giving Robinson some tips to help him learn the offense. Robinson was Los Angeles’ starting left tackle in 14 games last season and started 42 games over three years at tackle and guard. The Rams drafted him No. 2 overall in 2014 out of Auburn and he has not played up to expectations. Looking back, Robinson acknowledged his career has not panned out as he thought it would so far. “It hasn’t really went the way I would like,” Robinson acknowledged. Despite disappointing returns, the Rams were gracious when they cut ties with Robinson. Kouandjio started in seven of 24 games for the Buffalo Bills over the previous two seasons. The Bills released Kouandjio in May, a month after he was taken to a hospital for observation after police found him without pants on in a suburban Buffalo field about a five-minute drive from team headquarters. The Erie County Sheriff department said deputies responded to a complaint of a suspicious person when they came upon Kouandjio around 9:30 a.m. April 19. He was cooperative and no charges were filed. His car was discovered abandoned on a nearby highway by New York State troopers later in the day. “It’s in the past,” Kouandjio told Detroit-area reporters after he watched the Lions practice. Caldwell refused to say what Kouandjio told him about the situation. To make room for the new additions, the Lions waived long snapper Jimmy Landes and offensive tackle Arturo Uzdavinis.